Her memorial on findagrave.com indicates that, although she is remembered here, her body was never recovered after a hurricane swept through town. 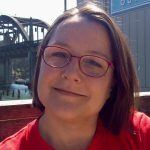 What made her loss even sadder for me was that – when I first discovered her online memorial – much of her identity had been lost as well, with her maiden name listed as Mitchell. Her oldest daughter was named Rebecca Mitchell Coffin, so it’s likely that subsequent generations assumed a connection to the middle initial on Lelia’s memorial. However, Rebecca Mitchell Coffin was named for her paternal grandmother, and her mother’s origins were entirely different. Lelia Coffin was born in the area of greater London known as Paddington, and was the daughter of Kezia Page and the Rev. Moses Marcus, a Church of England minister and schoolmaster. Around the time of Lelia’s birth, her father was hired to be curate (assistant clergyman) at the Church of the Holy Sepulchre in Northampton, and it was in this church where she was baptized Kezia Jane Lellias on 1 January 1822. Shortly after Moses Marcus took up his post, his boss – the Rev. Edward Robert Butcher, who had also been trained as a lawyer – tried to destroy him. Based on the anti-Semitic invective hurled in letters to the editor of the local newspaper, E. R. Butcher’s chief objection seems to have been the discovery that his curate was a convert from Judaism. Throughout this very nasty ordeal, the parishioners unanimously stood behind Moses Marcus, as did his bishop Herbert Marsh, for whom the Marcuses named their next child. 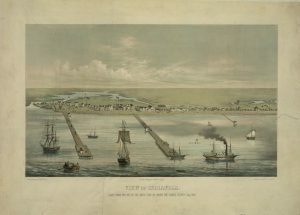 Lelia’s father then undertook a variety of positions in England and on the continent before heading alone to North America, where he arrived in New York on 2 April 1834. Two months later he was hired to teach school in Hallowell, Ontario, Canada. Then tragedy struck in January 1835, when Lelia’s mother died leaving four young children alone in Bletchingly, Surrey, about twenty miles south of London. Exactly how Lelia and her siblings made their way to the United States is not known, but soon they were living with their father, who had become chaplain at the Sailors’ Snug Harbor, a retirement home for old seamen on Staten Island. Perhaps it was the romance of the old sailors’ tales that inspired him; in any case, Lelia’s older brother William soon made his way to Nantucket with plans to sign on as a whaler. The gritty reality that met him on the island soon changed his mind, and he took up a teaching position instead. On 1 January 1838, William Marcus married Lydia Athearn Cary, my great-great-great-great-grandmother’s orphaned namesake niece. The groom’s father came to Nantucket to conduct the marriage at the home of Lydia’s guardians, James Athearn and Lydia Cary. While he was on the island, Moses Marcus concluded that it was ripe for the planting of an Episcopal church, and he arrived back on Nantucket only a few months later with his four children and brand new wife in tow. Soon Lelia Marcus met Alfred Coffin, and they were married by her father in New York on 1 March 1841. The young couple lived for a couple of years on Nantucket (where Lelia’s name is incorrectly listed as Lilian in the town’s vital records), then in New York, and finally in Lavaca, Texas, where they were enumerated in the 1850 census. By 1870, Lelia was living in Indianola, surrounded by her five surviving children … and that is where they all were, along with their own spouses and children, when three quarters of the town’s buildings and more than 150 of its inhabitants were swept away by a devastating hurricane. The town rebuilt, only to be finally destroyed by an even larger hurricane in August 1886. I can’t restore the lives lost on 16 September 1875, and I can’t recover a body for her grieving family to mourn over, but I can reclaim the rightful name and history of one victim of Indianola’s first hurricane. Herbert Marsh Tonsor MacKenzie Marcus (1822–1861). Herman Melville’s brother, Thomas, served as governor of the institution from 1867 to 1884. Lydia Athearn (Cary) Marcus (1817–1896), daughter of Charles and Lydia (Swain) Cary. James Athearn (1784–1852), son of George and Hephzibah (Hussey) Athearn. Lydia (Cary) Athearn (1785–1862), daughter of Edward and Lydia (Hussey) Cary. Marianne House (1812–1877), daughter of Col. Eleazer G. House, a Boston printer, and his first wife, Nancy Cunningham. Alfred Coffin (1821–1880), son of Gorham and Rebecca (Mitchell) Coffin. A wonderful story and great detective work. Brava, Pam. Thanks! I really enjoyed doing the detective work, and Lelia’s father is such an interesting (though unsung) figure in the history of the Anglican Church, both in England and the United States. One of his brothers was also a Church of England priest. Pamela, Your family stories are so interesting! Just one question: What took Lelia and Alfred to Lavaca, Texas? Any info on their journey to get there? Thanks! I’m afraid that I have no real idea, other than a gradual decline in the whaling industry on Nantucket in the 1840s, with a severe depression in the price of whale oil in 1843. A lot of Nantucketers transitioned into other forms of oil, so at first I’d imagined that might have drawn them to Texas…but they were in the Lone Star State far too early for that. Petroleum wells didn’t really come online until 1859, and that was in Pennsylvania. Lelia’s husband Alfred was listed as a laborer in the 1850 census and a sailor in the 1860 census, so it’s likely that he’d continued a maritime profession from his youth on Nantucket. I would assume that the family sailed from New York to Lavaca, Texas, given that they are both ports, and that overland travel would have been very grueling. Curiously Alfred was NOT listed in the 1870 census in Indianola with the rest of his extended family. The only man in the US I can find as a good candidate is “Albert” Coffin, a cooper in San Francisco. The profession seems a natural fit for an aging whaler, and Alfred’s slightly younger brother married “a Spanish woman” in California around 1850…so my money is on “Albert” really being Alfred, who died in Missouri in February 1880, a few months before the census was taken. Too many emails today; I almost didn’t click through, but I’m sure glad I did. An interesting story on many touchpoints. I’m glad you found it worth the tedium of slogging through all those other emails. When Vita Brevis posts in my email I would like to see the title in the subject line with the author’s name.